Live players should prepare for some significant differences when moving over to the online game. 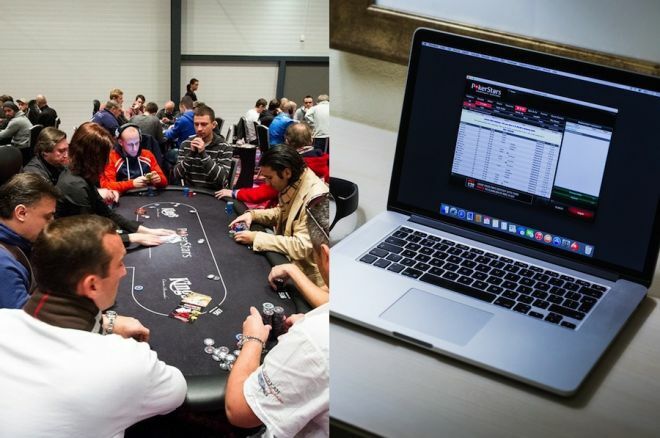 Avoid common mistakes live poker players make when playing online -- the games represent two different universes. Transitioning to playing online poker? A lot of live poker players have tried to make the jump to playing online poker. One of the best things about playing online is the convenience. Within minutes you can literally be playing as many tables as you want within the comfort of your own home. However, the transition to the online game is not always as easy as many people think it will be. Many live players in particular tend to make a couple of self-defeating mistakes when making the move. This is unfortunate because many of them could probably end up beating the online games, but they never really gave themselves a chance. In this article, I am going to discuss the two most prominent mistakes I see live players consistently making when transitioning to the online game. Playing at stakes that are too high for their current skill level is without a doubt the number one mistake live players make when transitioning to online play. For no-limit hold’em players, $1/$2 is often the smallest cash game offered in casinos. Many live players naturally figure that they will just start at this level online as well. The problem is that these two games are two different universes in terms of players’ skill level. $1/$2 online is actually a very tough game these days with most tables being full of people who either play for a living or who take the game very seriously. It is much better for somebody who is used to playing $1/$2 live to start out at much lower stakes online. This will ensure that the level of competition is closer to what they are used to. This is not a problem because most online poker rooms offer cash games where the buy-in is as little as $2. Unfortunately ego sometimes gets in the way for people, though, and they can’t play for such a small amount of money. But the reality is that the skill level in these “penny games” is typically on par with what they are used to in the casino. Even the $0.10/$0.25 or the $0.25/$0.50 games online these days tend to play at a much higher skill level than your typical $1/$2 live game. If you are a live player who is looking to make the jump to online play and do it the right way, then, I would suggest starting at the very lowest stakes no matter what. And here’s the other thing — if you find the games to be really easy at these stakes and you have big success right away, then you can easily move up the limits very quickly. What’s the rush, right? One final thing about online poker, and online poker strategy, is that even though the money might seem incredibly small to you at first, the ability to multi-table means that you can effectively start playing for much more. For instance, if you play 10 tables of the $10 buy-in game, then you essentially have $100 in play which is probably an amount which is much more familiar to you in your live games. The other big mistake I consistently see live players making when they try playing online is vastly underestimating the differences in variance. Variance refers to short-term fluctuations of your bankroll depending on how good or bad you are running. Nobody can prepare you for the pace of the online game. You have to experience it for yourself. The average online table deals hands about 3 times as fast as a live table. There are also “fast-fold” games that are now popular online where the action can be as much as 12 times as fast as what you are used to when playing live. When you add in the ability to play several tables at once, this effect just gets multiplied again and again. This is like getting behind the wheel of an Indy car when you have just learned how to drive. There is just no way that you will be prepared for it. And if things don’t go well for you to start, this means that you will see the bad beats and coolers at a pace far more rapid than anything you have ever experienced before. This leads many live players to believe that online poker is somehow rigged against them. Of course, this isn’t actually true at all. Their big mistake was trying to bring a live understanding of variance to the online game. Once again, these are simply two different universes — the key is to stop comparing the two. You should instead take what you think you know about how often beats and coolers are “supposed to happen” and throw it out the window. It takes time to get used to the crazy swings you will experience online and you need to remember that there will be good ones, too. But my suggestion is not to obsess too greatly over what happens in the short run in this game. The only thing that matters are your results after months or even years in some cases. Anything less than this is just short-term madness where literally anything can happen even for the very best players. As difficult as it may seem at first, you need to stop concerning yourself with the day-to-day or even week-to-week drama. No matter how good or bad things have gone, this is not a statistically significant sample relative to your long-term results. The transition from live to online poker is not as difficult as many people make it out to be. First, make sure that you start at the very lowest stakes no matter how good you think you are. The relative skill level between live and online is often much different than many people think. Again, if things go exceedingly well to start, then you can move up the limits right away. But don’t rush it. And second, you need to expect completely insane swings online unlike anything that you have ever experienced before. When the pace of the action is 5x, 10x, or even 50x what you are used to, nothing is going to be the same. Just play solidly, keep your wits about you, and focus on the only thing that matters — the long run. Nathan “BlackRain79” Williams is the author of the popular micro stakes strategy books, Crushing the Microstakes and Modern Small Stakes. He also blogs regularly about all things related to the micros over at www.blackrain79.com. Tommy Angelo Presents: But It’s Not Gambling!